Cathédrale Notre-Dame, located in the 4th arrondissement on the Île de la Cité, is the most visited monument in Paris, even more popular than the Eiffel Tower. 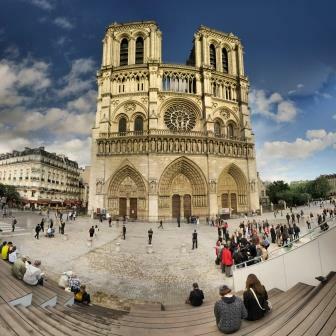 This cathedral is not only known for its representation of French Gothic architecture, a style that commonly prevailed around the late medieval period, but also as the official seat for the Archbishop of Paris. The entrance to the Cathedral is free but you have to pay if you want to visit the towers. You will be able to see the gargoyles and have a closer look at the architecture. You have to note that the stairs are narrow, so we also do not recommend it to pregnant women. You will have with this a self-guided walking tours to discover the neighborhood at your own pace through an itinerary. Please note that for safety reasons there is no skip the line ticket for this activity.